Gifts to the Hopkins Parents Fund go directly to student programming and activities that are not covered by tuition and fees. With your generous support, we are able to offer additional resources, support services, events, and activities throughout the year that enhance student life and provide an important balance to the rigorous JHU academic experience. 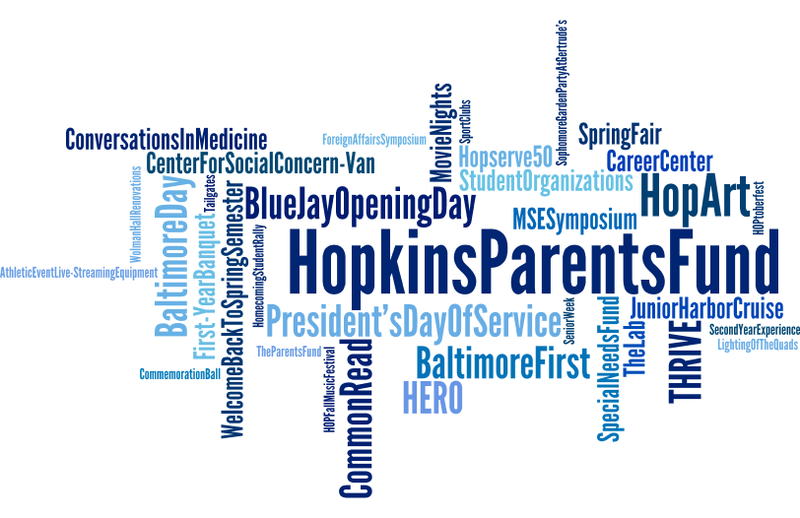 Additionally, we invite families of graduating seniors to take the Senior Parent Challenge by making a gift to the Hopkins Parents Fund in honor of their student or another individual who impacted their Blue Jay’s experience at JHU. We encourage you to consider joining the Parents Leadership Circle and membership in one of our philanthropic, leadership groups — the Hopkins Parents Council or the President’s Parents Roundtable. Both of these communities offer distinct opportunities for families to engage with the university and enhance student life at the Homewood campus.